In addition to the optical observatinos, multiwavelength monitoring has been done using satellites. S. N. Shore, S. Starrfield, P. H. Hauschildt, G. Sonneborn, and R. Gonzalez-Riestra, observing with the IUE satellite, report in IIU Circular 5925 that the IUE satellite has been observing N Cas 93 since shortly after its discovery. The first UV spectra on Dec. 12.1 UT showed the nova at UV minimum, "with most of the opacity coming from overlapping absorption lines from the iron group elements: the iron curtain". IUE observations obtained about every 4 days indicate that "the ejected material has remained in an extremely optically thick shell stage". On Dec. 22 a UV rise by a factor of three occurred, and the integrated UV flux of the nova remained nearly constant through Jan. 12. The optical light curve of N Cas 93 is similar to the light curve of the bright nova of 1934, 1804+45 DQ Herculis, which reached magnitude 1.5 in brightness, and declined with fluctuations until it reached magnitude 4.8. At this time - 108 days after discovery - DQ Her showed a dramatic decline: it faded from magnitude 4.8 to 8.3 in 2 days and then continued to fade, reaching 13th magnitude in another 28 days. Following this impressive decline DQ Her slowly brightened to about magnitude 6.5 in another 75 days and then resumed its decline. Novae such as DO Her and, more recently, NQ Vulpeculae, form an optically-thick dust shell about two to four months after maximum light, resulting in the optical light curve fading dramatically and then recovering. The optical light curve and ultraviolet and infrared multiwavelength observations reported in IAU Circulars 5916, 5922, and 5925 suggest that Nova Cas 93 may behave like DQ Her, in which case a dramatic decline in brightness would be expected in late March. 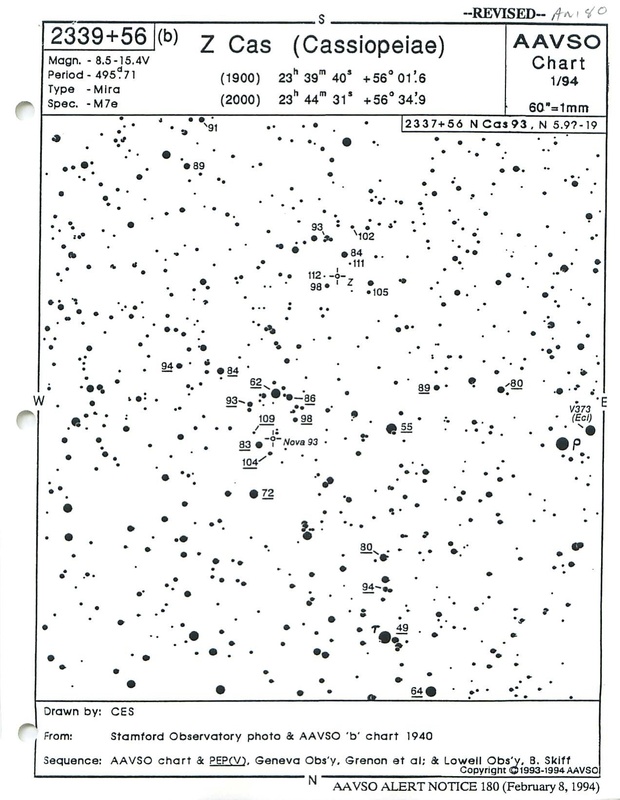 Please use the accompanying b and d scale charts prepared by C. Scovil when making observations of the nova. Please record the exact time of observations to four decimals of the Julian Day. 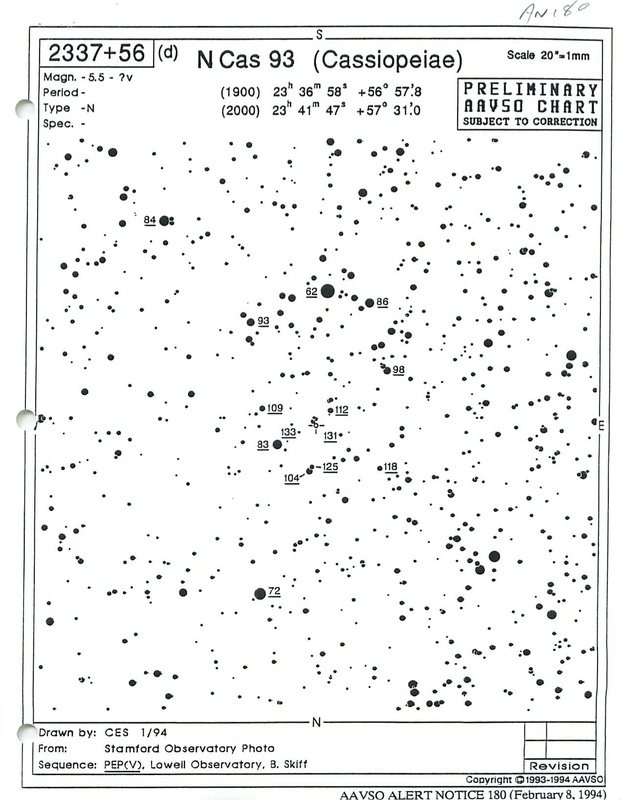 Please note that the accompanying b scale chart shows two revisions from the chart distributed with AAVSO Alert Notice 179 - the magnitude label 93 belongs to the brighter of the pair of stars southwest of the nova; the 71 comparison star to the northeast has been eliminated from the comparison star sequence. This former 71 star has been reported to be a small amplitude variable, and although the Geneva Observatory photometry does not indicate it as variable, the Hipparcos Input Catalog indicates it as a double star, so the recent variability reported may be due to this factor. Our sincere thanks to all our visual and photoelectric observers who have been calling in observations of N Cas 93. Please continue to call in your observations using the charge-­free 800 number (800-642-3883). The answering machine is on nights and weekends for your convenience. Astronomers wishing to observe outbursts of 2138+43 SS Cygni, 0409-71 VW Hyi, and 1247-28 EX Hya with the EUVE and IUE satellites have requested our help in alerting them when these stars start to brighten. As always, we turn to you, our dedicated observers, to monitor these stars and call us when they go into outburst. Many thanks for your efforts and valuable observations. Particularly this winter, when the midwestern and eastern parts of the US have been having arctic cold weather, contributions from our observers there and from our observers all around the world are acknowledged with much appreciation and gratitude. NOTICE: Subscribers to the AAVSO Alert Notices can now also receive the ASCII text of the Alerts via email, transmitted when the paper copies of the alert are sent out by postal mail. To receive the email version of the AAVSO Alert Notices, please send us email, including your full name, email address, and postal address, at one of the email addresses below (whichever is best for you). Unfortunately, we do not have the ability to transmit the charts at this time - we are working on it.